Sydney Shop Girl: Psychedelic Pants. Saturday Was All White. Travel brochures are great messengers of escape and respite from the realities of everyday life. As I turn the pages, each destination proclaims itself as the place I next need to visit. I'm usually a creature of comfort whilst on holiday (as numerous posts on this blog will confirm) but the Saturday paper came with an Intrepid Traveller brochure and I suddenly became SSG the rough and ready action vacation traveller. 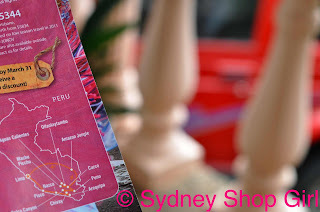 Peru was the country that won my heart. The colour and vibrancy of the people, the breathtaking natural landscapes and the possibility of a visit to The Amazon were the deciding factors. Speaking of rough and ready, did you spot the red off road vehicle in the photo? It's H's new pride and joy. He came to visit this weekend with the aim of getting his car, doing the rego changes and just hanging out in the city for the weekend before heading off for a recreational ocean swim on his way back north. It's a Suzuki from the mid 80s and has a very retro and solid feel to it. What sealed the deal for H was the current season beach permit, the extra soft road wheels and the ability for the boot to fit both a surfboard and an adult male or two with relative ease. You might ask what I was doing watching the golf on a Saturday morning? Two words - psychedelic pants. 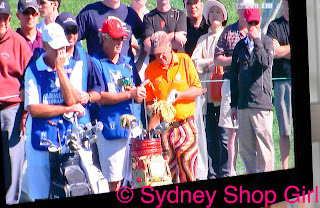 I don't actually know the rules of golf but how could I not sit and watch John Daly pacing the course and swinging his clubs dressed as he was? Unfortunately, duty called. In the shape of brunch. Now this is a sight I've never been part of before. 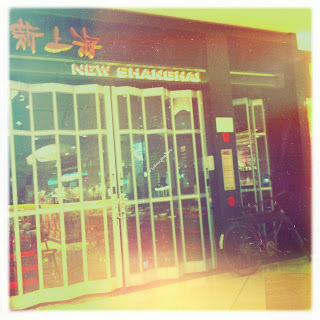 Being at the beginning of the line for Saturday dumplings at New Shanghai and waiting for them to open the flood gates! 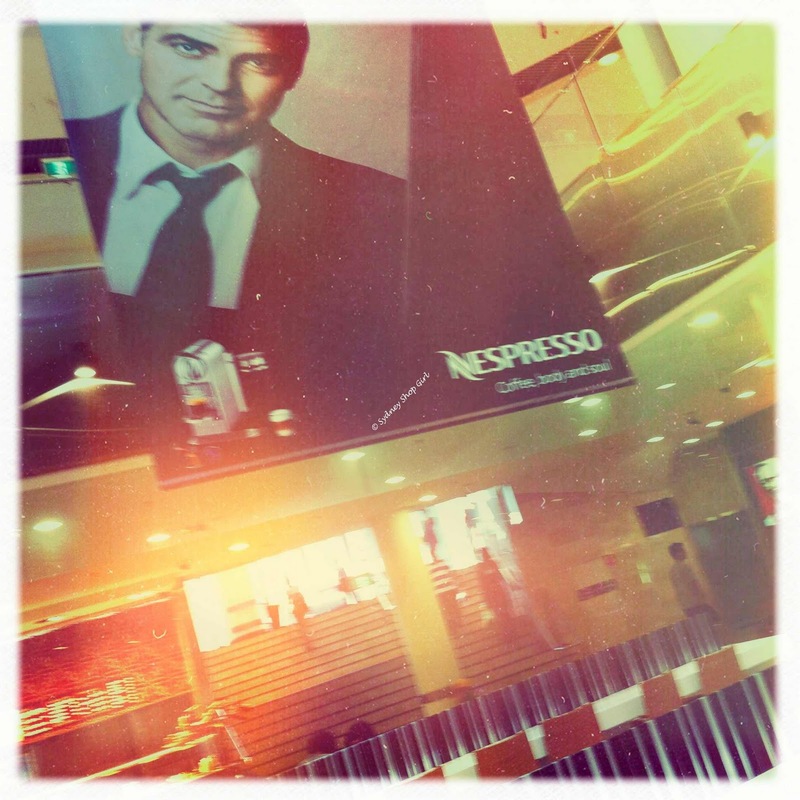 It must have been the benevolent presence of George Clooney gazing down upon me. I know this may seem glaringly obvious from where you are but just for my benefit, I think the following needs to be said. If you're a 35 year old woman who decides go bather shopping after a large brunch, you've got body confidence and I salute you. If you do it wearing the North Shore uniform of ballet flats and preppy basics then, for the love of Mike, walk away from any store front bearing signs like this. Because you really are going to be at least a head shorter and several hand spans wider than the spokesmodel of an iconic swimwear label. Seeing as Lara did not explicitly consent to be part of my blog, I've made an attempt to protect her identity. Perhaps, to balance the photo, I should have offered her one of my RPE necklaces? Sorry W & L, I was too star struck to talk about my outfit.... Next time. For the record, Lara was lovely. She obviously has had lots of practice speaking to 30 something women who follow her wardrobe and daily life through the glossips. She diplomatically didn't talk about bathers and the lady she was with very kindly and expertly took this photo. I didn't buy bathers after all, that would have messed with my mind even more. I got a new pair of hand paddles for freestyle practice. Which, strangely, Lara has never had to model in any Speedo campaign I've seen. 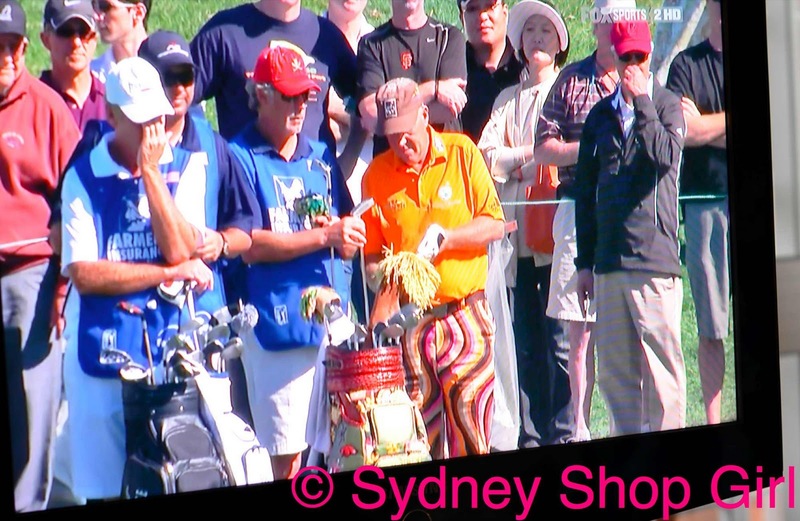 I came away from my unexpected brush with Sydney celebrity with a couple of useful model secrets. 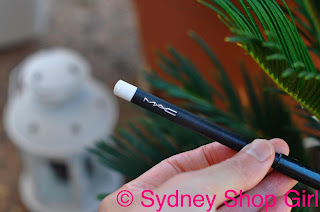 Firstly, white eyeliner on your lower lashline is as important to life as brushing your teeth. Do not leave the house without it, a perfect tan or a statement dress. Secondly, wear heels (or black suede ankle boots) at all times. Even if you're in Chatswood Chase on a hot Saturday afternoon as a shopper not a sales assistant. 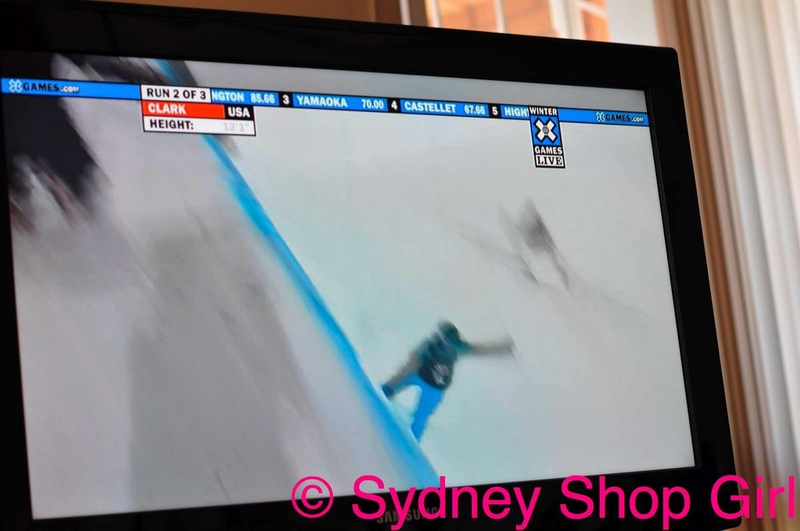 Less threatening whiteness was found with the X Games held at Buttermilk in Aspen. The place where I learned to ski. The snow boarders were moving too fast for me to photograph. They are breathtaking to watch. The speed and agility with which the scale the half pipes. Whilst wearing what looked like just a couple of flannel shirts and low slung pants. Perhaps the adrenaline rush is a good Goretex substitute. It really hasn't taken long for the blog to find itself back on the topic of online shopping or sparkling beverages, has it? I'm taking this as a sign of progress and recovery. 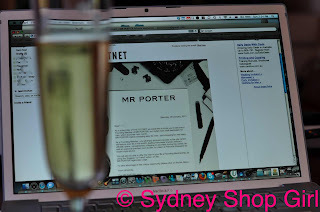 Mr Porter is launching next month! Strangely, I received this notice due to my being on the Outnet mailing list as opposed to NAP. Does this mean Mr P will be run based on the discounted price model? Do they know husbands too well? 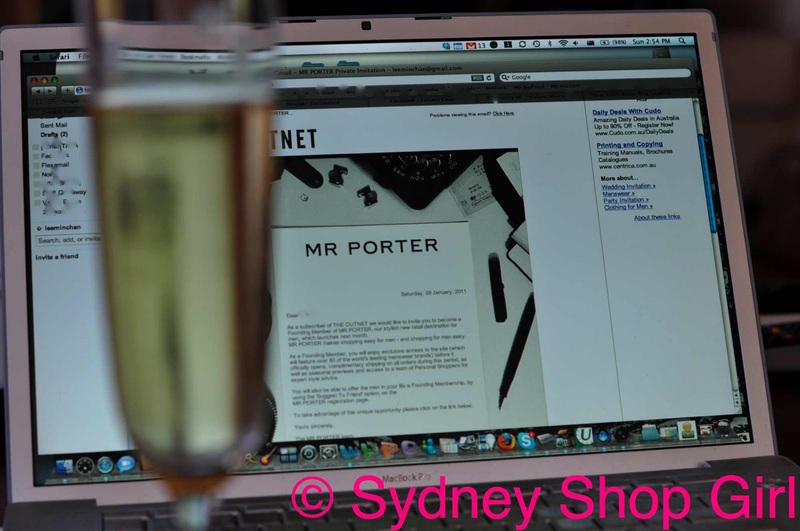 Anwway, Mr SSG's birthday is coming up and I've invited him to become a Foundation Member of Mr Porter. I can still feel the gratitude and excitement in the air. Take care everyone and once again, thank you so much for all your emails and comments. I've had the privilege to get to know quite a few more readers these last few days. I still owe a few people an email. Pity it is under such difficult circumstances. 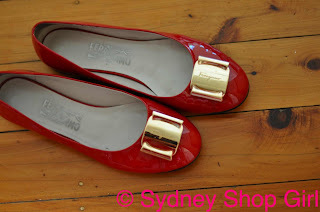 I don't do the white eyeliner but I love red shoes and they go with Mr.SSG's HB's new car! Those pants are indeed very colourful. Needed a bit of George today - thanks for that. It's SO good to hear you happy SSG :) Are you going to go to Peru? Crazy golf gear is hilarious, like cray cray polo gear. I love that old men strut around in MC Hammer esq pants like it's nothing... hilarious. There is definitely a North Shore Uniform going on isn't there? I notice it often and sometimes I find myself subscribing without even realising. Thank goodness I work in the city for the moment and can snap out of it. I agree with you on the travel brochures. Even if I'm just reading them for inspiration and dreaming. 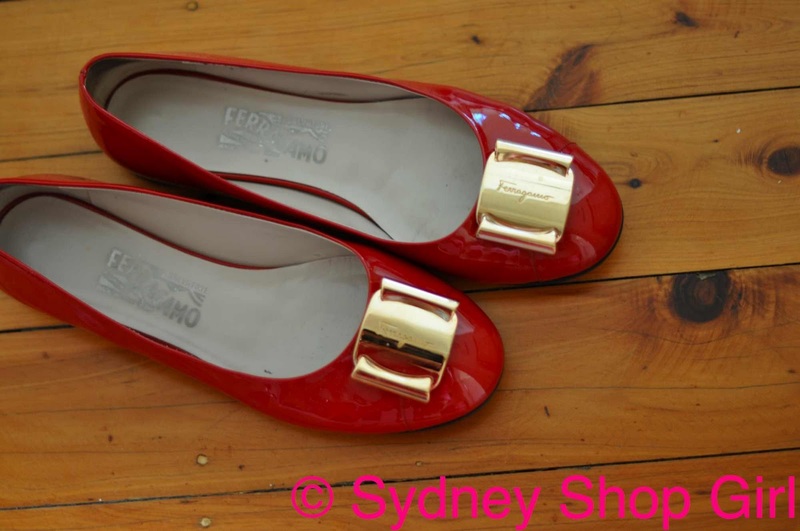 Those red ballerinas of yours....*melt*...so, so lovely and chic! Thanks for putting our necklaces out there SSG - they look lovely on you! Merowyn: thank you. It is too hot for eyeliner or heels, I'm afraid. Sniff: thank you. I'm so brave when I read travel brochures but bail out and go to really boring holiday destinations mostly. Kitty: yes, you need to shop the big F when you go the US. North Shore Prep is good in small doses. L: thank you! Will continue to be a brand ambassador when the need arises. OzJane: need to come across the East for a bit. Perhaps via Bondi Beach so I can get boho beach hair before hitting The Junction. Semi Expat: I am. Things should be sorted out pretty soon.